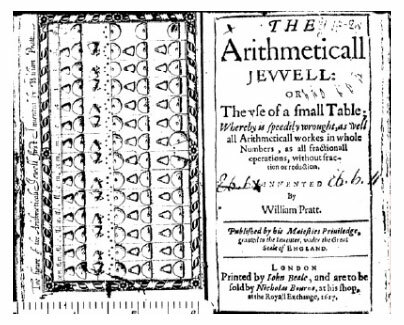 The calculating device called the Arithmetical Jewell was designed by William Pratt in 1616, and described in the book of the same name (The Arithmeticall Jewell: or the use of a small Table Whereby is speedily wrought, as well all Arithmetical workes in whole Numbers, as all fractional operations, without fraction or reduction. Invented by William Pratt. Published by his Maiesties privilege, granted to the inventor, under the Great Seale of England), published in 1617 in London (see the image below). Pratt, in association with John Harper and Jeremiah Drury, received a patent (privilege) on 27 March, 1616, "for the sole making of a table for casting accounts." The Arithmetical Jewell permitted addition, subtraction, multiplication and division to be undertaken without use of pen and paper. William Pratt was a mathematical practitioner and a member of the active circle of London's mathematical teachers, close to the famous Gresham College, where the logarithms of Napier were popularized. His device was nothing more than a rudimentary mechanical reconfiguration of the conventional reckoning technique: a portable, fancier and gentlemanly adaptation of the century-old techniques of calculation like plume (manual calculations) and jetons of the abacus. With the exception here that you did not need paper to inscribe, for instance, the carry-over numbers of an addition; one could instead, using a small metallic stylus, "inscribe" them on the instrument's appropriate sectors of brass. The reckoning method, nonetheless, was precisely the same as the plume and jetons. Although a number of these new and sophisticated devices might have created some excitement in the field of arithmetic, they were still founded on established century-old techniques of calculation. It was not until two mathematical practices (rabdology and logarithms) were invented in the yearly 1600s by the Scottish mathematician John Napier, that the early modern science of calculation took a genuine new turn. 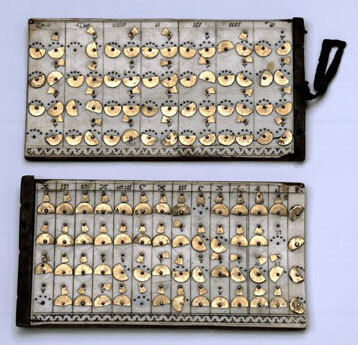 The Arithmetical Jewell comprises two ivory faced wooden tablets, with dimensions 122 mm x 65 mm x 5 mm each. One tablet (below in the picture) has 14 columns, each with small brass parallel sectors. The other has seven pairs of columns for laying out astronomical fractions to the base 60. Dr Pell told me, that one Jeremiah Grinken [a mathematical instrument maker] frequented Mr Gunters Lectures at Gresham College: He used an Instrument called a Mathematicall Jewell, by which he did speedily performe all Operations in Arithmeticke, without writing any figures, by little sectors of brasse [or some semi-circles] that did turn every one of them upon a Center. The Doctor has the booke… he told me, he thought his name is [William] Pratt. Two copies of the actual instrument were known to exist now—one in the Department of Medieval and Later Antiquities, British Museum, and the other in National Museums of Scotland.